enhancing battery life and ensuring maximum performance for vehicle charging systems. 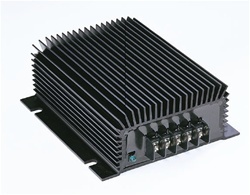 Converters provide fixed outputs to power 12V loads directly where a 12V battery is not available. An optional switched output is also available which corresponds to an IGNITION input signal. The two outputs are then summed for maximum output capability.